Phil Church: One Way Ticket to Mars? 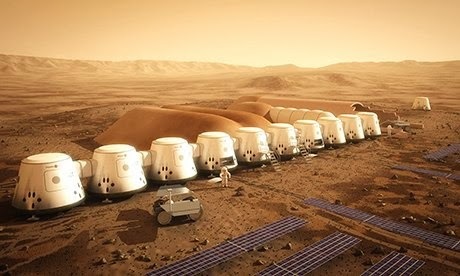 This afternoon, whilst I was supposed to be marking essays, I found myself reading this article on the Mars One project http://www.theguardian.com/science/2014/jan/19/mars-one-project-human-colony . I love the idea of visiting space, and when I win more than £6.70 on Euromillions I fully intend to buy myself a ticket on one of those Virgin Galactic flights. But the Mars trip has one major drawback. The article says that the four volunteers will be given a ‘one-way ticket’ to the Red Planet. Then it shows them smiling, doing domestic chores and looking all well-adjusted and normal. One woman casually says: ‘The majority of my communication with my family is by phone or text anyway, so I'm used to having them at a distance.’ What? How mad do you have to be to say goodbye to everyone you know and head off into space for the rest of your life? How are these people passing any kind of psychological test? Surely anyone that emotionally detached is likely to chop everyone else in the colony into tiny pieces then listen to Beethoven and drink tea as though nothing has happened?